With powerful chips, tremendous graphics power, and a high-speed, versatile charging port, the Galaxy S8 is basically a handheld PC that fits in your pocket. The only thing that’s holding it back is its screen—and maybe a keyboard and mouse. While the S8+’s 6.2-inch display is nothing to scoff at, it still pales in comparison to the 27-inch monitors that grace our desks, or even the 13-inch displays on our laptops. So Samsung has developed a solution. The DeX Station is a puck-sized dock that connects your S8 to a big-screen monitor so you can type and multitask just like if you were using a PC. Once it’s plugged in, a new interface will appear on your monitor, and all of your phone’s apps will be just a click away. Google has been trying to make Android more productivity-friendly for years, adding features like Multi-window, quick app switching, and picture-in-picture, but Samsung’s new concept blows the doors off of our perception of what we can do on our phones. While we still have lots of questions—chief among them, how well will it run six months from now—from what we’ve seen so far, DeX is the missing link between our pockets and our desks that we’ve been waiting for. The DeX dock is super light and portable. You’ll need to carry a pretty bulky power cable along with it, but the device itself can be stowed away in a bag without adding much weight at all. Its unique puck-shaped design lets the cover double as a cradle for your S8 with just a snap. Around the back you’ll find a pair of old-school USB-A ports, a 100Mbit ethernet port, and an HDMI port. All you need to do to start working is plug in an HDMI cable and connect the other end to a monitor (up to 4K), and the contents of your phone will be instantly displayed in a pleasant, Chromebook-like interface on the big screen. The DeX includes two USB, ethernet, and HDMI ports. Along the bottom you’ll see Wi-Fi, volume, and other settings, as well as a series of app shortcuts, and on the left side will be a grid of DeX-optimized apps. These include a smattering of Samsung’s own apps, like Internet and Email, but more will be available over time. Apps that have been formatted for DeX have resizable windows and interfaces that behave like a desktop (or at least a tablet) version should. For compatible apps, the DeX desktop supports all of the usual functions of a PC environment, including maximizing and minimizing of windows, right-clicking, and keyboard shortcuts (cut, copy, paste, undo, etc.). Non-optimized apps will still show up on the screen, though as phone apps. You’ll be able to use the mouse to control them, but you won’t enjoy any of the other PC-inspired stuff. Apps launched quickly and resized smoothly in our brief time using it. 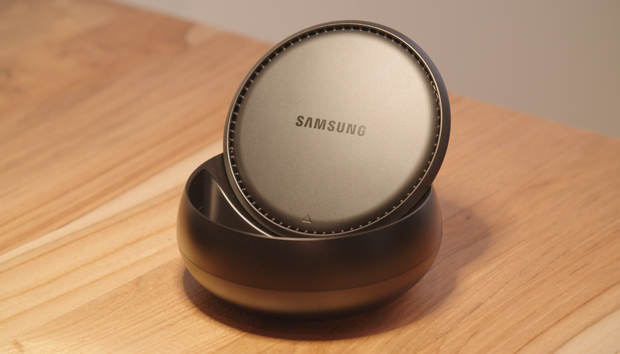 Samsung has also partnered with Microsoft and Adobe to create DeX-ready versions of their popular Android apps. Microsoft will release the entire Office suite for DeX, while Adobe will offer a version of Lightroom. While there aren’t any new features to speak of, the user interfaces (which resemble the ones you get on tablets) have been retooled for the big screen, with a maximized workspace and responsive, resizable windows. Additionally, DeX will let you run virtualization software to get the full Windows 10 experience. Samsung has partnered with VMware, Citrix, and Amazon to offer full Windows virtualization with DeX, and you can even run your Android apps alongside Windows apps. However, there’s no interaction between the two environments, so you won’t be able to copy and paste content between windows. Samsung hasn’t yet optimized its new Bixby digital assistant for DeX, so you won’t be able to control any actions by voice. Presumably Samsung will add that functionality sometime down the road, but it had nothing to say on the matter during my demo.